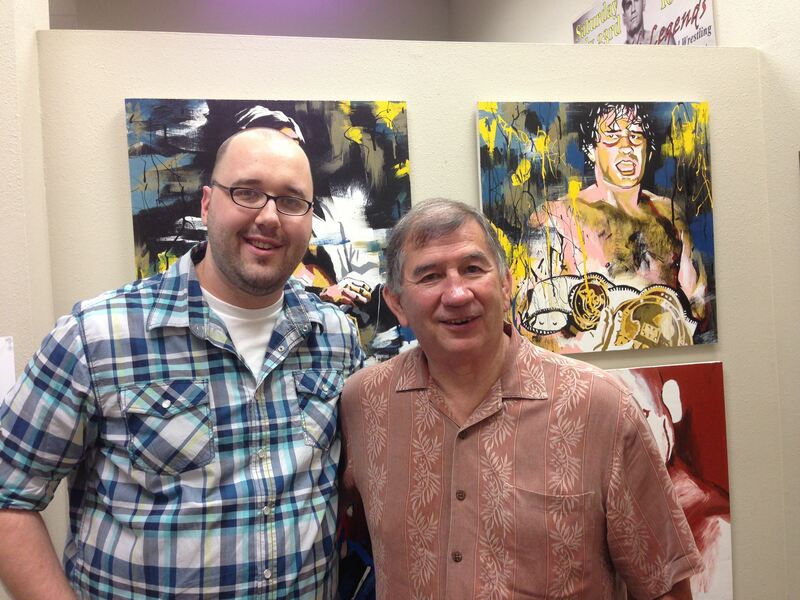 Rob Schamberger (L) with Jerry Brisco. A lifelong lover of comics, Kansas City based artist Rob Schamberger has had his written work published (“The Believer” in 2001 through Image Comics) and has self-published four graphic novels. He may have found quite a nice for himself, however with his latest project involving superheroes of the squared circle. Schamberger, 33, is currently devoting time to his Champions Collection – a portrait project of professional wrestling world champions from WWWF/WWF/WWE, WCW, TNA, ROH, ECW, NWA, AWA, USWA, WCWA and WWA. Funded through Kickstarter, the project will include 250 champions when completed. A few months ago, I became aware of your work. Were you a wrestling fan growing up? Actually, no. I didn’t get into it until I was 18. I had moved out on my own already at that point and like every 18-year-old guy that’s moved out on his own, I would go to my parents’ house to do laundry once a week. My stepfather was a wresting fan back in the ’60s and ’70s but had pretty much stopped watching. We were watching TV on a Monday night and he was flipping through the channels and landed on Ric Flair doing a promo on WCW, around ’98/’99, and I was just hooked. The next week, (I) went to try to find it again, and luckily landed on WWF’s product instead. They were just firing on all cylinders at that point. Watched every week since. I noticed with your art, you do have a lot of really old school stuff mixed in. Not just newer guys. Was it one of those things that once you kind of got hooked, that you went back and sought out a lot of that older stuff? Yeah, I’ve got kind of, not even kind of, totally obsessive compulsive behavior where when I get into something, I jump in 100 percent. I wanted to just know more. Where did this start? What else is there going on behind the scenes? Who are these people? What kind of training do they do? What happens when they get out of wrestling? I just had to know everything about it. How old were you when you took an interest to art and found out, maybe I’m actually good at this thing? I was about seven when my older stepbrother bought me my first comic book and we spent the whole weekend redrawing everything in that book. He said to me, “You know people get paid for this.” All these years later, I found out how wrong he was about that. But, it stuck with me. Right off the bat, I was learning, you can do this professionally and how much work goes into it. I’ve been a professional artist since I was 17. I self-published my first comic book then and started taking on more comic book work, as well as freelance illustration. Working as a writer, as well. That self-published mentality has stuck with me since, even to what I do now. I do all the work, all of the shipping and packaging and stuff, all of the marketing. It’s all me. What mediums do you prefer? Whatever feels appropriate for the piece I’m doing and a lot of it’s driven by commissions or paid work. I like to work with everything I can get my hands on. Again, it’s a 100 percent all-in thing. I feel that I’m required to get to some level of mastery with each medium and it bugs me if I don’t. How did that whole connection come about with guys in the business finding out that you did this kind of stuff? What piece did it start with? I kind of had the idea for the whole fundraiser thing at the beginning of the project. Before the wrestling stuff, I had a long time working in comic books and the last thing I worked on was a wrestling graphic novel that, unfortunately, didn’t quite come to fruition. All the work I put into it, I still had that in the back of my head. Then it hit me. There wasn’t, and arguably still isn’t, anyone of a fine art, professional art background doing serious work about wrestling. Anything respectful. Wrestling is not, if you just want to get right down to it, overall, it’s not respected by the general public. It’s just not one of those things that’s respected and I think most of the guys in it get that and know that going into it. Yeah, and that’s what I wanted to address with the work. When I had my first few gallery shows with this stuff, all those art snobs totally had their noses up to the stuff. You know, screw ’em. I found an audience that’s in wrestling. Wrestling fans that truly appreciate the work. The way that everyone became aware of what I was doing was through the Kickstarter fundraiser. The first one was saying I planned to paint every world champion going back to George Hackenschmidt back in 1906. And it will be about 250 portraits when it’s all done. The fundraiser was to help me get the supplies and the studio space I needed for that. In a month, I was able to raise $20,000, which is still pretty awesome. Through the process of promoting that project, a lot of wrestlers had seen what I was doing and got in contact with me. First was Adam Pearce, who was NWA Champion at the time. So, I’m like, “Wow, a current world champion is taking notice of what I’m doing.” Adam and I have become pretty friendly since. After him, Colt Cabana, and then the first guy to buy his portrait from me was David Arquette. He’s actually got it hanging up in his living room now. It’s so funny to think that of all these people, David Arquette – who’s a punchline when it comes to wrestling history and being a world champion – he’s the guy who bought your first one. That’s hilarious in a way. And straight up awesome. I was actually there for that ridiculous triple cage pay-per-view that WCW did. But I thought that was incredibly cool of him. Right off the bat, a lot of people with credibility are paying attention to what I’m doing. So, I was able to continue to build on that to where I am now. Top-level guys in the industry are contacting me on a regular basis. It’s really incredible to think that you went from just a fundraiser … to what it’s grown to. It’s insane. I made as much money in December as I did in the rest of my art career. It’s been about that way every month since. Now, that’s not saying much about what I make now (compared) to the pitiful amount I made before. I moved away from comics, which was, what I always thought, my final destination. I wasn’t quite geared for being a comic book artist, but I still wanted to make art and found this other avenue. This is my full-time thing now. I do this all the time. Paint wrestlers all day. How did you decide the promotions and who you would recognize as a world champion for it? First, I set it to just American promotions because that’s where my knowledge base is at. I’m not saying I won’t include Mexican, Japanese, Canadian, European at some point. Just not now. I’ve only done 71, 72 of the Champions Collection paintings out of 250. So, I’ve got a ways yet to figure out what comes next. Then, I went with the obvious major ones and then there are a few others I added in because of the guys that held it. The current wrestling fan is not too much up on the WWA or USWA, unfortunately. But there were some notable guys that held (titles). Scott Hall, people say he was never a world champion or Owen Hart was never a world champion. They were both USWA World Champion. As was Jerry Lawler. One of the more interesting ones I saw that you’ve already got up is Mantaur or Tank, who was a USWA champion. To have that included in there is so bizarre. Memphis was one of those odd places in a lot of ways. There’s a guy from USWA that I know, most likely when I do this painting, I’ll just be hanging onto it forever unless some really awesome collector comes along and buys all of them. A guy named the Dragon Master. He was like seven feet tall, a real beast of a guy. He only held it like a week. Pretty much won it in his debut, dropped it back to Lawler a week later at a house show and was really never seen in wrestling again. By doing all these different promotions, you’re going to have a really eclectic mix of guys. Especially the original champions back when it was more of a shoot. Hackenschmidt and Gotch and Stanislaus Zbyszko. When I do each of the portraits, I always put up a brief bio of the guys. A lot of people that are WWE, TNA, Ring of Honor fans that don’t know a lot of the history, they’re getting a lot from the biography stuff, too. Including a portrait of Stanislaus Zbyszko with Triple H and the Rock, it shows that this guy was a top-level guy and should have the same amount of respect, if not more, when you look back at his career. It’s a neat byproduct of this whole thing. When did the tour (for the project) come about? I’m not afraid to say that calling it a tour was a marketing thing. I had several shows that I wanted to exhibit at all within a few weeks of each other. I knew at the time, I didn’t have the money to go and do it myself. I had successfully completed that other Kickstarter and thought, “Well, hell, I’ll do another one.” I gave myself a month to raise $5,000 and I think I got just shy of $7,000. Fans are one of the most awesome parts of this whole thing. Yes, it’s really awesome when Triple H publicly says my work is great, but it’s even more awesome when a hardworking person puts that hard-earned money into buying one of my paintings or my prints. And I appreciate it so much. Then, putting further investment into the Kickstarter campaign. It enabled me to take my work to the next level to where I was able to do Chicago, Ft. Wayne, Ind., New York and Las Vegas all within about a month of each other. I was about three miles from the convention center (for Wrestlecon in Secaucus, N.J., during Wrestlemania weekend in April) when I was T-boned by a semi. It destroyed my truck and I lost about 60 paintings and thousands of prints. Luckily, I only had one scratch from it. I lost everything – my display, everything – for my biggest show. I put up what happened on Facebook and Twitter, that I was fine. The massive outpouring of support from people, I didn’t expect. I just wanted them to know I was fine and I may not be exhibiting at Wrestlecon. I got hundreds, maybe even 1,000, letters of support from people. My printer back here in Kansas City reprinted everything and overnighted it to me so that I would be able to exhibit. Also, Ken (Tuccio) with Barber Shop Window (barbershopwindow.com), we had done a shirt together, he phoned me up and said, “Hey man, I’ll make you some more prints on the house.” All the guys running show were supportive and understanding. I ended up having my biggest sales day, still to date. I had a line of people wanting to make sure one, that I was OK, and two, to pick up some prints to help me get back on my feet. At the Cauliflower Alley (in Las Vegas), I met the Rock’s mom. She got a print of him from me and we took a picture together with it. She asked me if it was OK if she sent that photograph to Rock and I was like, “Yes, that’s OK, ma’am.” Met a lot of people there that have become good friends. Who are some of the guys who have really reached out to you … and complimented you about your work? My two biggest supporters, outside of Adam Pearce obviously, have been Jerry Brisco and Jim Ross. I met them last year at the National Wrestling Hall of Fame (in Waterloo, Iowa) and became mildly acquainted with them and over the course of the last year, I would argue we’re friends. They’ve got connections they can put me in touch with that have helped tremendously. Colt Cabana got a painting from me that was his birthday present to (CM) Punk last year that was pretty awesome. It was the Dino Bravo weight lift from the first Royal Rumble. It’s in Punk’s private gym now like a joking inspirational poster. That was pretty fun. Seth Rollins and Roman Reigns. 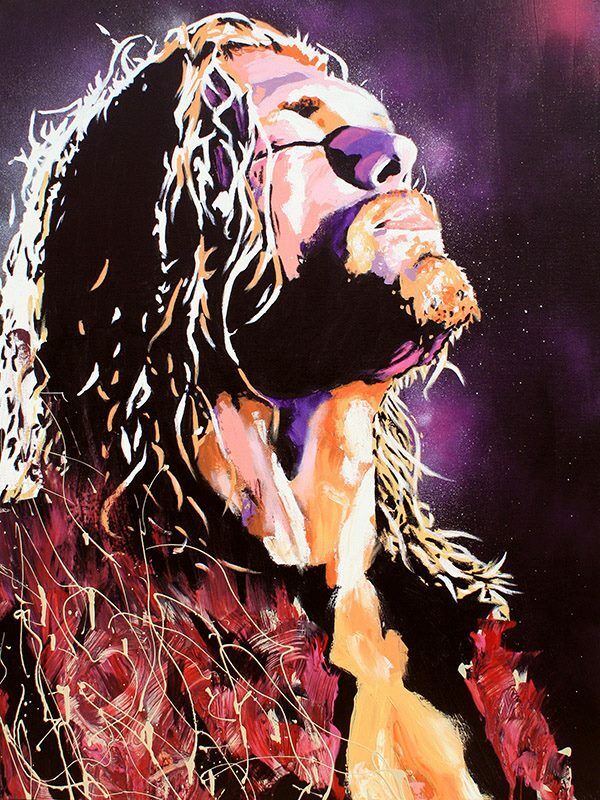 Seth Rollins still uses my painting as his Twitter profile picture. Bray Wyatt’s been awesome. NXT, itself, over the last couple of weeks has been really supportive. Are you on any type of time frame (with the project) or just doing it as you can? I’m in a very luxurious position in that I can take my time on them. I got a pretty good feeling, pretty quickly off the bat, that this collection is going to be – I sound so pompous when I say this – but it’s going to be something important when it’s done. So I think every piece needs to reflect that. Do you have a piece … one or a couple in particular that you’re most proud of? You’re asking me to pick my favorite kid. I think my portrait of Edge is my best one to date. Speaking of someone that’s been super supportive. That guy is such a genuine, good person. The National Wrestling Hall of Fame, the Dan Gable Museum, he was being inducted this year and I did the painting ahead of time and put together some prints to benefit the Museum. He loved it. He made the painting his profile picture on Twitter. Schamberger’s portrait of Edge from the Champions Collection. Me, him, Jim Ross and Jerry Brisco ended up closing down the bar that night. Talking about their time in wrestling and music and stuff. That was so cool. Being able to just talk about the painting, itself with him was pretty neat. For more information on Rob and the Champions Collection, visit robschamberger.com, the Art of Rob Schamberger on Facebook or follow him on Twitter: @robschamberger.